Welcome to the Longueville Tennis Club Web-site. 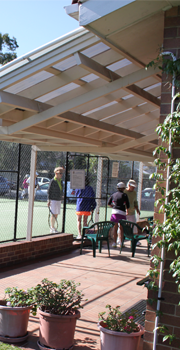 We are an established club offering 5 top class synthetic grass tennis courts with a spacious and charming clubhouse. Our aim is to improve local community participation in a healthy lifestyle through delivery of tennis and social activities in a convenient and inviting environment. Two of our courts are available for public hire on a casual basis and our clubhouse may be hired by approved persons, subject to authorisation by the Committee.